Support Bounce DMT & Trampoline Club with easyfundraising.org.uk. The club hosted a children in need bounceathon on 16th November and raised £135 for the charity. Thank you to everyone that supported the event. Sara Gorman passed her Level 1 Coaching course. Congratulations! The club hosted a charity bounce for the Oliver Smith Appeal on 11th February 2012. We raised £110 from donations and a cake sale. Thank you to all that came and supported the event. The club was extremely pleased to receive a grant for £3,373.63 from the Grass Roots Fund. For More Information See Club News. Members of the club competed in the Club I and County H on 27th June 2010 with results as follows: Club I: U11G - Katie Davies - 17th, Megan Rose - 21st, U13G - Autumn Jones - 9th, Hannah Sutton - 11th, Leah Garderton - 19th, Mya Chisholm - 25th, Team - 3rd & U15G - Megan Kennedy - 12th County H: U11G - Grace Ware - 13th, U15G - Bethany Baber - 13th, Katie Jessica Kincaid - 32nd & U19B - Ryan Price - 1st. Well Done to all! Congratulations to Teresa Kincaid and Rebecca Eatwell who recently became qualified judges. Members of the club competed in the Club I and County H on 28th February 2010 with results as follows: Club I: U11B - Ethan Eatwell - 11th, U13G - Hannah Sutton - 16th, U13B - Cian Baber - 16th, U15G - Jessica Sharpe - 20th, Megan Kennedy - 33rd & U15B - John Jennings - 4th. County H: U11G - Grace Ware - 10th, U15G - Bethany Baber - 13th, Katie Gorman - 27th, Jessica Kincaid - 28th & U15B - Joshua Russon - 1st. Well Done to all! Congratulations to Aileen Baber & Teresa Kincaid who recently passed their level 1 coach courses. Welcome to the Official Bounce DMT & Trampoline Club Website. 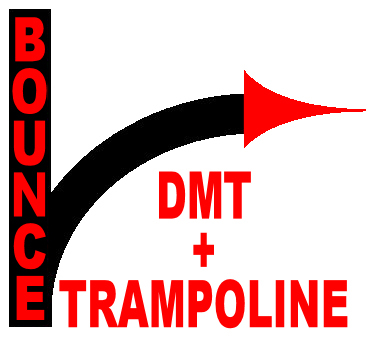 This site contains information about the Bounce DMT & Trampoline Club, as well as general information for trampolining and Double Mini Trampoline (DMT). Information is updated and added regularly on this site. If you have any comments or queries do not hesitate to contact us. Bounce DMT & Trampoline Club is a British Gymnastics Registered Club. It is based at The Isle Of Sheppey Academy - East Site in Minster-On-Sea, Sheppey. It runs sessions for children and adults of all abilities. Please see the Club Sessions section for more details. There are currently fourteen coaches in the club consisting of three Level 4 Senior Club Coaches, four Level 3 Club Coaches, four Level 2 Coaches, two Level 1 Assistant Coaches and one trainee coach. The club enters regular competitions at club, county, regional and national level. Currently, over 70% of the members represent the club in competitions. Bounce DMT & Trampoline Club is committed to provide a high quality level of coaching for all members, whether they wish to be competitive or just want to enjoy the disciplines of DMT (Double-Mini Trampoline) and Trampoline Gymnastics. Members are encouraged to work towards their own personal goals: be it fitness; BG badges; local, regional or national competitions; judging or coaching. We are the only club in Swale able to offer DMT and trampolining side by side and we focus on team spirit. British Gymnastics Registration Number: 69772.